The S&P 500 (SPX) fell nearly 3% on Thursday morning, after the CFO of Chinese tech giant Huawei was arrested. This will complicate relations between the US and China during a period in which they will be trying to negotiate a complex trade deal. This market is clearly trading in a high risk environment, as market cycles suggest this near-term weakness will last until late December. Canadian authorities took Sabrina Meng into custody on December 1 on charges related to violations of sanction on Iran imposed by the US. This was done as a part of an investigation of the US Attorney for the Eastern District of New York so that she could be extradited. The arrest complicates relations between the US and China during a period in which they are trying to negotiate a complex trade deal. Yet it’s not clear how much influence those involved with the negotiations will have on the investigation, which involves a measure of independence. With the S&P 500 falling sharply, our analysis has shown major deterioration, with an expectation of a rebound into early 2019. The chart patterns now indicate riskier conditions. We note the market cycles and the “flag pattern” which is likely to resolve to the downside. The question is how long this range can hold up. With oil down again, it is clear how susceptible stocks are to downside risk. 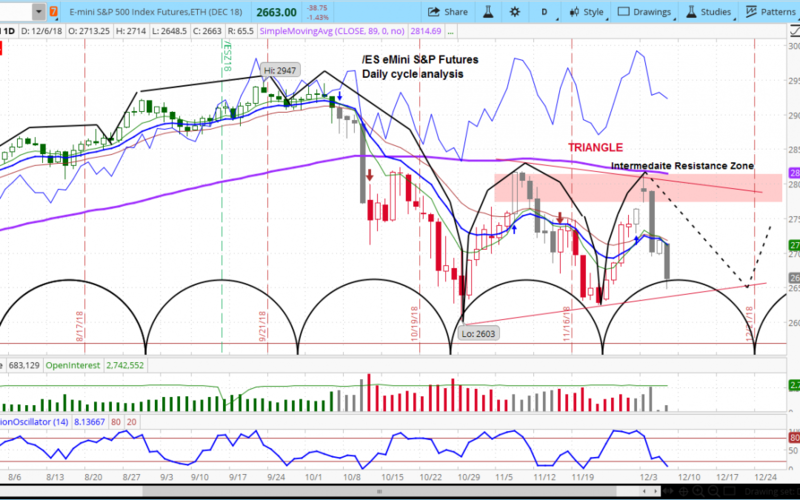 We believe that short-term market cycles suggest that this weakness could last until around December 23, after which our expected bounce is likely to occur. “It is simply fantastic to be engaged with you and the new site…and these charts are real winners for me.